Astin, A. W. (2005-2006). Making sense out of degree completion rates. Journal of College Student Retention: Research, Theory & Practice, 7(1-2), 5-18. Xu, Y. J. & Webber, K. L. (April 2016). College student retention on a racially diverse campus: A theoretically guided reality check. Journal of College Student Retention: Research, Theory & Practice, 20(1), 2-28. Braunstein, A., McGrath, M., & Pescatrice, D. (2000-2001). Measuring the impact of financial factors on college persistence. Journal of College Student Retention: Research, Theory & Practice, 2(3), 191-204. Gonzalez, K. P. (2000-2001). Towards a theory of minority student participation in predominantly white colleges and universities. Journal of College Student Retention: Research, Theory & Practice, 2(1), 69-91. Hlyva, O. & Schuh, J. (2003-2004). How a cross-cultural learning community facilitates student retention and contributes to student learning. Journal of College Student Retention: Research, Theory & Practice, 5(3), 325-344. Johnson, J. L. (2000-2001). Learning communities and special efforts in the retention of university students: What works, what doesn't, and is the return worth the investment?. Journal of College Student Retention: Research, Theory & Practice. 2(3), 219-238. Kreysa, P. G. (2006-2007). The impact of remediation on persistence of under-prepared college students. Journal of College Student Retention: Research, Theory & Practice. 8(2), 251-270. LeSure-Lester, G. E. (2003-2004). Effects of coping styles on college persistence decisions among Latino students in two year colleges. 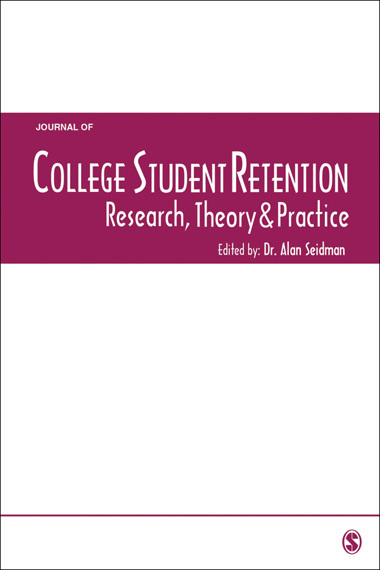 Journal of College Student Retention: Research, Theory & Practice. 5(1), 11-22. Lundquist, C., Spalding, R.J., & Landrum, R.E. (2002-2003). College student's thoughts about leaving the university: The impact of faculty attitudes and behaviors. Journal of College Student Retention: Research, Theory & Practice, 4(2), 123-134. Nippert, K. (2000-2001). Influences on the educational degree attainment of two-year college students. Journal of College Student Retention: Research, Theory & Practice, 2(1), 29-40. Potts, G., Schultz, B. & Foust, J. (2003-2004). The effect of freshmen cohort groups on academic performance and retention. Journal of College Student Retention: Research, Theory & Practice, 5(4), 385-396. Rajapaksa, S., & Dundes, L. (2002-2003). It's a long way home: International student adjustment to living in the United States. Journal of College Student Retention: Research, Theory & Practice, 4(1), 15-28. Seidman, A. (2004-2005). Commentary: Defining retention. Journal of College Student Retention: Research, Theory & Practice, 6(2), 129-137. Tinto, V. (2006-2007). Research and practice of student retention: What next? Journal of College Student Retention: Research, Theory & Practice, 8(1), 1-20.